Maureen, you are a wild woman! That is all I can say about you as I picture you madly singing along while delicately hand painting easter eggs.It must be a lot of fun to hang out with you. FUN!! I love Easter, too. We're going to the zoo for brunch and an easter egg hunt. And then to my mom's for mimosa's. Booze is always involved in my family. Such pretty eggs!!!!!!!!!!!!!!! Have a great Easter!!!! Wow, you are quite the talented artist! The extent of our decorating involves 8 glasses of Paas dye on the kitchen table. But still a tradition nonetheless! And cool deal. How many people can say they've met Jesus! Awesome eggs! I want to see all the hand painted ones. WOW!! Those are some fancy eggs. I hide in the garage and eat lots of ham....that is what the holiday is all about, right? There is supposed to be some religious significance associated to it? News To Me. Sweet Irene: I don’t know about wild, but I DO embarrass those around me… is that close enough?? Ann(ie): Ooohhhh… I love the Zoo. Too bad we still have a lot of snow on the ground… it makes egg hunting near-impossible. Jill: Thank you! Have a great Easter as well! Angelo: Yes, it seems you’re never too old to paint eggs… Happy Easter to you too! Jeff: Aw, shucks, thanks. Met Jesus twice and lived to tell about it at least! Megan: Thanks! 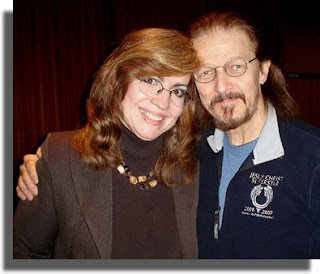 JCS is one of my favorites… it’s not everyone’s cup of tea, but I love the power of their voices, the styles and sayings from 1973… the mix of old and new. It was / is groovy fun! Creative-Type Dad: Gosh, you’re sweet! Thanks! Lotus07: Hide in the garage? Away from the family gathering perchance? Yeah, I’m baking a ham this year too… a big sucka with a brown sugar merlot sauce. Yummy. Isn’t that what holidays are for? To eat, eat, eat and then eat some more??? When my kids were younger, we tried dipping eggs... with no great success! I even tried one of the "oily" ideas where you're supposed to get the colours swirling around each other... nope... didn't happen either. This year, the only eggs in view were the ones on my plate... YUMMY! Loved the way you wrote this, and I like the way you put in the crossed out word to poke fun at yourself. Had to laugh out loud at your description of "Feline Abuse!" Your Yoda egg is AWESOME! You have some major talent! Holy Cow! those eggs are incredible. They must take forever to paint. You are an very talented artist. I know here we use about 3 different dye kits, and make a mess. Should I mention that I'm also doing with kids that are 25,21,18 and 16! They get more on themselves! Now as for the singing... I would do that also and my kids would yell at me, telling me I'm singing off key... I really don't think so though. They are crazy. I sound great (cough,cough) I'm sure,lol. Wow, that's a lot of time spent on those eggs.. I must admit Easter is nothing much more than 4 wonderful days off work to me! Have a wonderful Holiday, Maureen!! The eggs sound amazing...you are totally gifted. Wow. Your eggs are AMAZING! 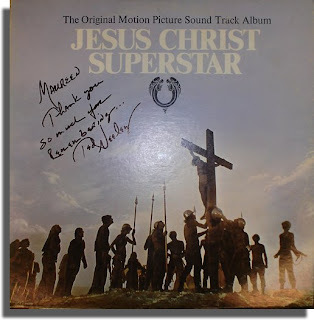 And I have never seen Jesus Christ Superstar. I KNOW...can you believe it??? 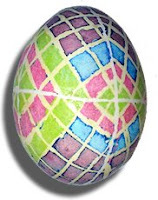 Master egg painter you are. Jesus Christ Superstar?!! I knew I liked you! I sing those songs all year long. Sounds a lot like my family! My parents' tradition? Waking up my sister and I to The Sound Of Music soundtrack. To this day, they still call us up and play it loudly over the phone. 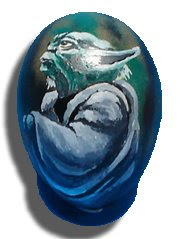 The Yoda egg is the coolest thing I've ever seen. Though I saw a trailer for Wall-E yesterday, and I'm pretty pumped about that. another omg, girl, you doth reveal yourself in March! Awesome artistic talent there. And I so remember that dude and that musical, man, that and Hair and Tommy. Good memories, huh?